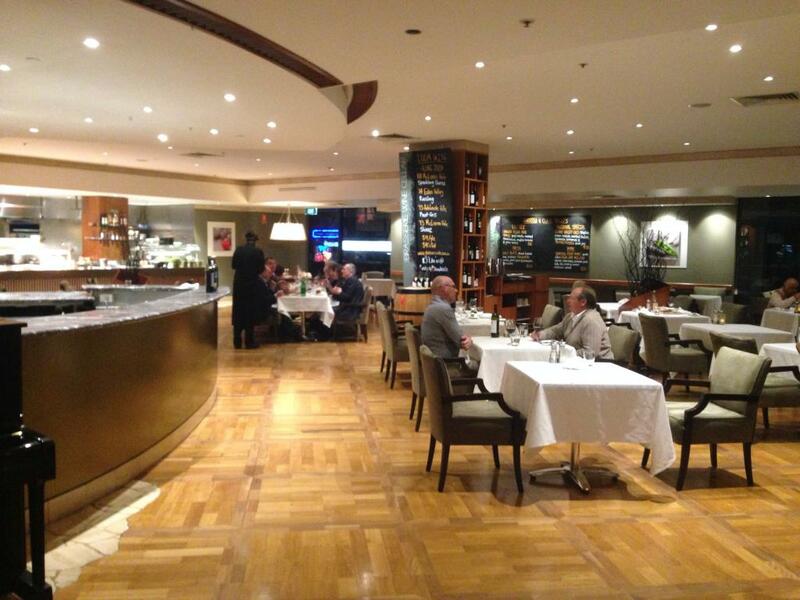 At the Hilton Hotel, on Victoria Square. 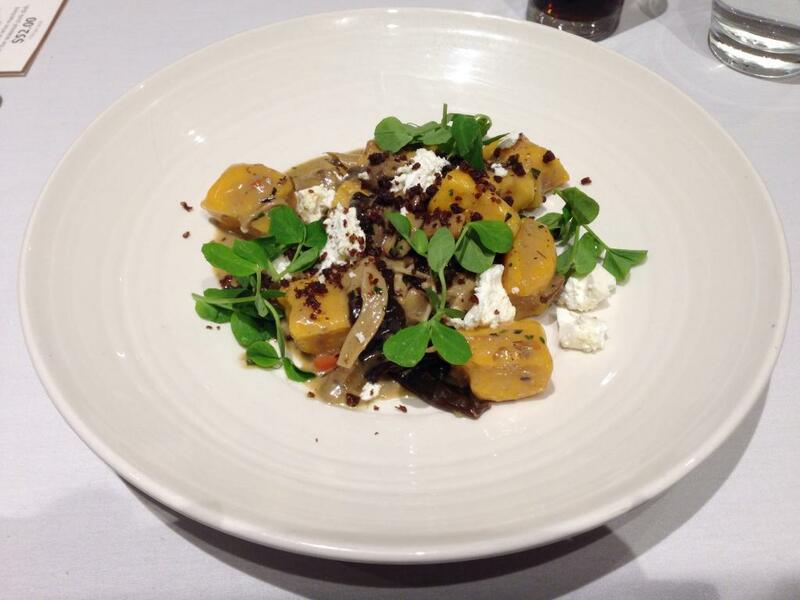 Pan fried Seven Brothers butternut gnocchi, wild mushroom ragout, Kris Lloyd Persian feta, pumpernickel pangratto. Seven brothers? That seems excessive. Too many cooks can spoil the broth. The actual pieces of butternut gnocchi here are really average. They have very little taste, and are excessively thick. They don't melt in my mouth at all. I need to laboriously chew these slabs of thick pasta up in their entirety. Other than the pasta, there are many subtle flavours here. The enoki and flat mushrooms add lots of interesting texture, and the small amounts of feta add the the strongest taste here - a nice, mild tang. 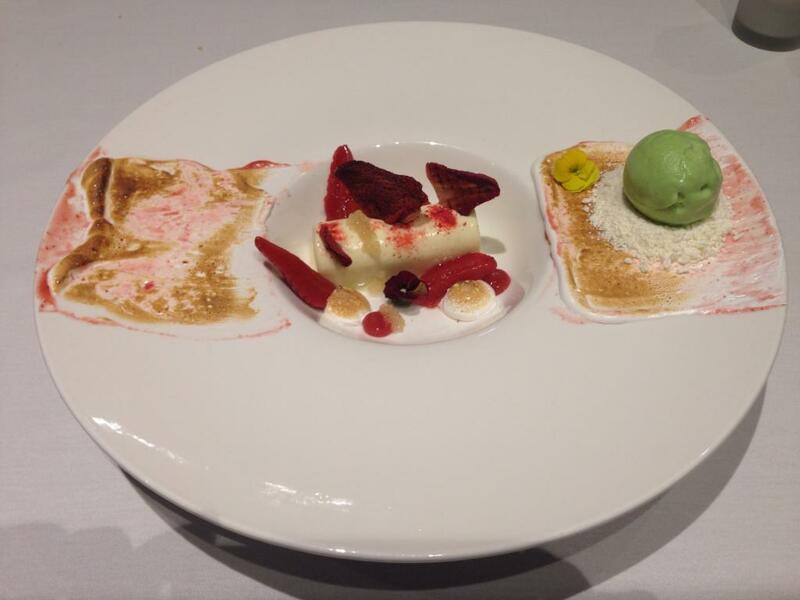 Adelaide Hills strawberries, finger limes, buttermilk panna cotta, scorched meringue, basil ice cream, white chocolate snow. There are so many components here. The dried strawberries sticking out if the panna cotta are leathery and tart. They'd be fine as a separate snack, but they're put of place here. The panna cotta has a bit of a mealy texture. I assume it's curdled, but I don't know. It's just a little bit porridgey. The preserved strawberries have some kind of odd, alcoholic taste. It's not quite alcohol though. It's just odd and off putting. There are smears and dollops of creamy marshmallow all over the place, and more strawberry concoctions, but they're all a bit weird. The scoop of green basil ice cream has a slight taste of basil, but it's not that strong. It ends up just having an unknown taste, and not being too far from vanilla ice cream. Apparently I was supposed to mix everything on the plate together, and the ice cream was supposed to balance out the tartness of other components.